Uranus Retrograde July 5 2011 More Revolution? Dane Rudyar author of An Astrological Mandala, and Marc Edmund Jones author of The Sabian Symbols in Astrology, did amazing work in the field of Karmic astrology. Each of the 360 degrees of the zodiac were determined to have specific symbolic meaning. AstrologyWeekly.com has a nice Sabian Oracle application and listings of each of the Sabian Symbols as well as Kozminsly Symbols. Today, there is a concentration of planets in the 5-6 degree range of various signs. If you have planets in these degrees, you are experiencing important transits in direct contact. Check out the Sabian Symbols for these signs and degrees to get a deeper understanding of these energies. Today is the station retrograde of the planet Uranus at 4 degrees 33 minutes of Aries. 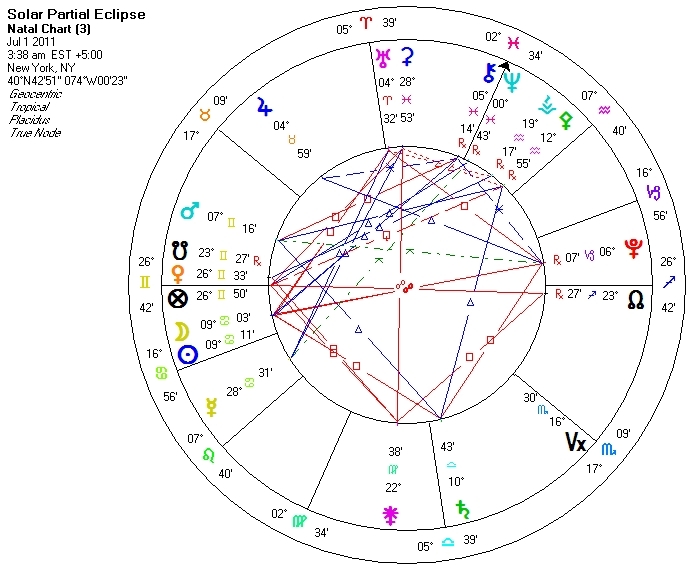 This powerful station will resonate with all 5 degree placements in your chart. The Sabian Symbol for 5 Aries: A white triangle with golden wings. Wings signifying the spiritual combined with the symbol of the trinitized diety could indicate the hand of God at work in the mundane experience. My interpretation of this is to predict that we will continue to see amplifying waves of revolutionary events through the balance of this year and not calming until the Spring of 2012. Welcome to Perfect Pattern Astrology! Welcome to Perfect Pattern Astrology! I have been practicing Astrology and Healing work since the mid-1990s and offer you the opportunity for gaining insight into your life situation through transit, relationship and astrocartography readings. I am available locally in New York City and Alexandria, Virginia and internationally through Skype (trinitywellness) and by email. I am available for in person, telephone and email consultations. Check out the current Moon phase below. Personally, I am a Moon ruled Aries, a rather schizophrenic and mixed blessing for a fire sign. The silver lining is that powerful moon placement on my ascendant leaves me intuitively blessed!